Welcome to the Cleveland, North Yorkshire and South Durham Family History Society as it is more formally known. The title was designed to describe more accurately the area of genealogical and historical interest covered by the Society. The name Cleveland originated from an ancient district which lay entirely to the south of the River Tees and stretched as far south as Whitby on the north-east coast of England. 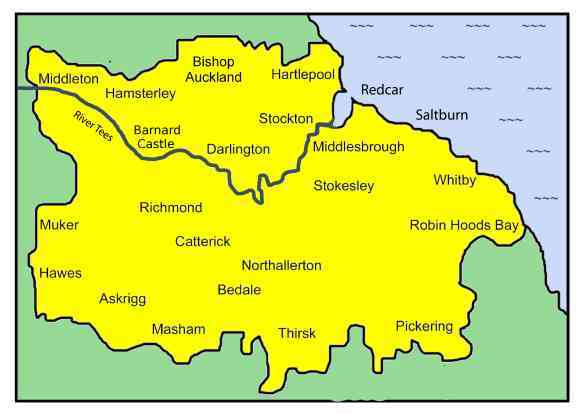 The name ‘Cleveland’ was adopted for a new county which survived for only 22 years from 1974, having been created from its predecessor, Teesside. The total area of genealogical interest is substantially larger than this County of Cleveland from which the Society originally took its name. However, we simply use Cleveland FHS. Over the last 170+ years the area along the banks of the River Tees which forms the boundary between County Durham and the old North Riding of Yorkshire has been famous for its abundant agricultural products, the production of iron and steel, shipbuilding and more recently, petro chemical industries. Sadly some of these no longer exist or are in decline. Prior to the discovery of ironstone in the 1840s, the population was mainly involved in rural occupations with boat building and fishing on the coast. Your visit to our website suggests that you may be researching your family history in the Cleveland FHS area and that you are seeking help in finding your long lost ancestors. Have you been knocking on the doors of stately homes looking for rich ancestors, or shouting down a mine hoping to hear a reply from one of your mining great grandfathers, or standing on a hill looking for a farm? Whatever lifestyle, occupation, or abode your ancestors had you may need assistance and advice to help trace them. North Yorkshire – most of the old North Riding from Whitby to Hawes. The Society continues to serve its members by offering a range of services including a quarterly journal, transcriptions of parish registers and other publications. Details of these can be found in different sections of this website. Monthly branch meetings are held at Hartlepool, Sedgefield and the Upper Dales where everyone, members and non-members alike, are very welcome to attend free of charge. Usually an invited guest will give an informative talk with a family history theme, with the opportunity to ask questions. Afterwards there is always time for a chat with other like minded persons. See the Society Notices section for more details. News & Events – Keep up to date with the latest announcements. Society Meetings – Venues, dates and times. Membership – Join Cleveland FHS or renew your membership. E-Shop – See full range of publications to buy online. Surname Database – Search the database to see names being researched by others. Burial Database – Have a search carried out for burials within the Cleveland FHS area. Parishes – List of parishes within the Cleveland FHS area. Know Your Parish – places that have been researched by members and submitted for publication in journals, which may provide useful snippets to find the information you are looking for. Useful Links – Links to other websites useful to genealogists. Search – Search the website for specific names or words. Contacts – The “Officers” of the society to contact when submitting articles for publication or to help resolve problems.